https://www.kipling-usa.com/sabian-crossbody-minibag/100230382.html Sabian Crossbody Minibag A mini bag with major possibilities. You'll definitely want to keep Sabian around, it's a brilliant way to tote around your essentials. A mini bag with major possibilities. You'll definitely want to keep Sabian around, it's a brilliant way to tote around your essentials. I am happy. Very nice ! It has a perfect size just to run errands and carry your essentials. Kipling is always a great idea! This is for a friend. Now she will love them too! Loved the look and workmanship....had to return....my wallet did not fit in, longer than the length of the bag...really small.Maybe good for a teen. So stylish & comfortable to use. It’s the right size to for all my necessities. I love every Kipling bag I own and this one's perfect for the basics I need when I travel. So great to have a little cash, my lipgloss and phone handy so I don't have to rummage in my carry-on! I LOVE my Sabian Crossbody Mini Bag!!! This is a great bag for throwing essentials (wallet, phone, keys) in for running quick errands! I love this bag. It’s slightly smaller than my regular bag, but it fits much more and is so lightweight. Great small bag! Had a tethered strap inside to hook keys etc. I just bought a Sabian crossbody bag sold as the Kipling Groovy Line crossbody bag from Lord and Taylor, in the pattern Watercolor. The name must have been changed and if not, the two styles mirror each other. The bottom line here is that no matter what the name is, this little bag holds a lot more than you would think. I was disappointed when I first received the bag as it looked cute but small. Boy, was I ever wrong! I used it the same day to go out to dinner with friends. The color went well with my outfit and I was able to fit my iPhone 8 Plus, a small wallet, my comb, my house and car keys, lipstick, a foldable fan, a small plastic box contains my phone charger and earbuds, and a couple of other small odds and ends. A great little bag! I am buying the Sabian in black. Nice bag. My regular wallet does not fit, but I think that's the point - need to lighten up! Perfect for any time I don't need to bring the kitchen sink with me. 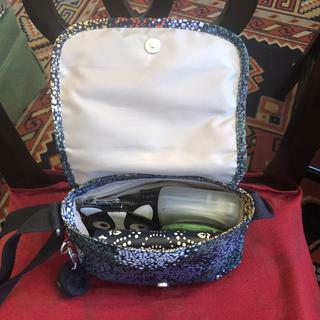 Love this little bag especially when traveling! Fits in Kipling backpacks when traveling...ready to just take out of backpack when going out with out unloading! A Bit To Small For My Needs, So I upgraded To One Size Larger! The Sabian was a bit too small for my everyday things, including my cell phone. Maybe good for someone just needing it for a quick run somewheres with their cell. But, I remedied the problem by exchanging it for a one size larger bag. I love all the Kipling items! I use this during the weekends for running errands, i'm always on the go dropping my daughter off at her extracurricular activities. It's the perfect size, lightweight and has lots of pockets. this was the perfect gift to give. I have my own #sweepstakes and I love it..... so I try to give what I like and I know for a fact is good product. Perfect size for a few items. Very stylish and lightweight. The gold color looks just as pictured and goes with everything. Love this bag. Lots of space yet very compact!! This little bag is such a great size and holds so much. I love the colors and have 5 of them. Great quality and yet so compact. Keeper coming. Love Kipling. First discovered them on a cruise with Holland America. Love l💗 ve the products. 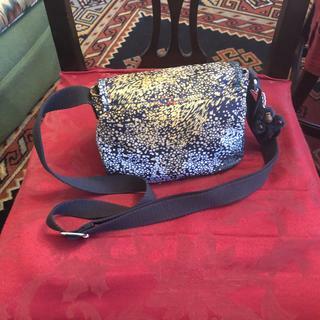 Really cute crossbody...good for running errands. Holds More Than You Think! I love this cute little bag!! It's a little cute bag, I like it! I am using it everyday, very convenient to hold your keys wallet and little things organized. Ready to go! Can use everywhere, any where and whatever the occasion be. The things that are great about this product is that it is small. The things that need improving for this bag is more pockets and a zipper for the inside closer. Love everything about this bag! Just love all the pockets and the little monkey key chain. I was looking for a small, light weight purse to grab and go! This is perfect when I want to carry just my phone, wallet, and small accessories. I like ir a lot, it's very comfortable and perfecta for me. I bought this for me to just grab and go. Easy to carry. Especially when you don't want a big bag to carry around all day. Absolutely love these bags. I have it in every color. They are amazing, perfect size and super convenient. Kipling Rocks! I bought it to my goddaughter. Granddaughter is in college and loves the size and convenience. Love the bag and the quality! YES. I've bought this product again. Really really love the mini. Purchased another color. I love this bag it's very well made and so easy to just grab and go. Really hate bully and uncomfortable bags and this bag is a game changer. I've actually been trying not to use it as much So I'm gonna have to buy another. Only con is I wish thdon't color was brighter I got the red. It's suitable for use by children. 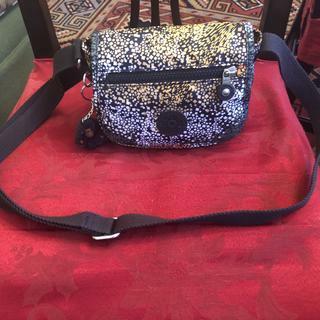 All Kipling Bags are Fabulous! Looks like it will be a great bag. Cute looking too. Perfect little bag for work. I am always walking from room to room at convention centers and it works great! Just for my keys, cards and some money when going grocery. I choosed Sabian Crossbody Mini Bag because it's a versatile and beautiful mini bag. Small and cute for college student on the go. My daughter likes the compact size of the purse, but it's still spacious enough to hold everything she needs to take with her. This is the perfect sized bag for Disneyland. Lightweight and roomy enough for the essentials. Front pocket is perfect for tickets and passes. Love this style. I chose this bag because I need a small bag to carry on the weekend. Friend showed me this size. Perfect. because I love the size and the color. I like the small bag and love the color black. And it's a crossbody!! Hands Free! Because my other daughter needs it and she likes your products too. Good quality!! I don't own this bag (yet), it's a gift, but everything Kipling is amazing and perfectly designed. I LOVE Kipling, have several and wanted this little one for quick access when in airports. Can't wait to get it!!! Perfect size and cute colors for my 10-year-old! Needed a 2nd bag for the mini-bag sale (2 for $50). This one seemed like it would be a good option for going out or traveling when I want to carry bulkier items since the Keiko seems like I might have trouble with bulkier items. SMALL AND EASY FOR PUT STUFF I REALLY WANT...AND GO. This bag is adaptable to any changing season, it is functional for both work and social casual wear. For traveling it comfortable for inserting in large bag for later usage. I just LOVE any bag from Kipling. I chose this particular bag because it's small and it doesn't hurt that it's on sale. Love this bag. Just big enough and a wide strap. What is the difference between black and travel? As of right now, we are having a small error on the site & 'Travel' is simply our 'True Blue' color. We are working to fix this as soon as possible! The "Travel" color is Navy Blue instead of the "Black" color. No difference. It’s very cute black or gray.